The banded rail, also known as Gallirallus phillippensis assimilis, Moho-patatai and Moho-pereru has the national threat category of "at risk". Photo by Sioux Plowman. Bird is approx. 30cm in height and weighs an average of 170grams. New Zealand's banded rail is one of 15 subspecies found in the Pacific. The banded rail is a largely terrestrial bird that inhabits a range of cover such as saltmarsh, mangroves, wetlands and shrublands. It feeds on insects, seeds and the succulent part of grasses and relys on walking to cover its territory. It is the closest living relative to the weka. Recently Annetjie Botha studied the foraging distances of the banded rail and found that the presence of mangroves overhead increased both the number and the range of banded rails. "In saltmarshes without mangroves, banded rail stay in close proximity to their rush roosting habitat. Here rail on average stay within 1m of rushes and never move more than 6m away. However when mangroves are present rail forage right to the seaward extent of the mangroves, up to 280m from rushes." and "Three times more banded rail footprints were found in the mangrove habitat than in the rush habitat". Earlier observations by Walter Buller in the late 19th century suggested the clearing of bush associated with colonisation created a spike in the banded rail's population. Click here for Buller's full description. Unfortunately numbers have reduced over the centuries due to predation of its eggs and of the birds. The banded rail can fly but does not fly well and therefore makes easy prey for cats. Its "at risk" status makes sightings in 2005 of banded rail footprints at Te Arai stream mouth a welcome find. 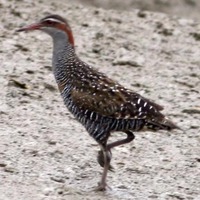 Click here to listen to a banded rail recording by Jane Vaughan.